I learned from Channel NewsAsia that there are 190,000 varieties of rice in the world. That moment of enlightenment made me wonder why there is no rice growing in Haa. I am selfishly crying about Haa because there lies my root and there still is my home, however this subject applies to all the places like Haa and colder than Haa. The 190,000 varieties of rice are not just any rice collected from different countries or based on their size and color, they are of different natures. There are rice that will grow in flooded land, and there are ones that will grow in dry land.There are also ones that will survive in drought, and strangely some can grow in salt water. There are even ones that will withstand extreme heat, not to mention extreme cold. And how come we always thought Haa is too cold for growing rice? A legend has it that once upon a time the protective deity of Haa, Ap Chundu and the deity of Paro went to mountains to bring home magical water that will help in growing rice. But on their way back the deity of Paro played a trick and made Ap Chundu drink till he went to deep slumber. When Ap Chundu woke up finally, the water they brought together was all gone to Paro. That's why rice grow in Paro despite being as cold as Haa. Furious Ap Chundu threatened to destroy everything and dry the river up, to which the deity of Paro promised to feed people of Haa with the first harvest from Paro. The tradition of offering the first rice harvest to temples and relatives in Haa is still practiced. Now, that was indefinite years ago and people in Paro have found hundreds of ways to deal with their harvest and Haa can no longer depend on the paddies in Paro. 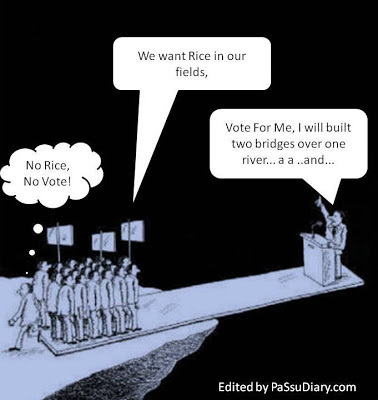 We need to grow our own rice. It's time to rewrite the legend differently. That's why I am looking forward to 2013 election. In last five years, nothing happened in my side of Haa, perhaps there was nothing there to do. We had roads, bridges, electricity, hospital, school, and water for a long time. I wonder what promises our MP made then. The only business that fed Haap was the trade across the mountain and that still remains illegal and our fields could only grow wheat, which is just enough to generate flour for performing lochoe. In 2013 I want my MP to promise 'Rice in Haa' and ask for 'Rice Vote', and fulfill the promised in his five years term and become a legend- The man who brought rice to Haa. But if our MP fails to think beyond farm road and bridges then our people must remind our MP to think out of the box and say we will only vote for rice. I am going to do just that! Though there may be political reasons we also need to think about the business we the haaps do. We bring blankets, flask, etc from China (Tibet) which the government says is illegal. The people of our place and our land (Haa) smuggle the goods from Damthang gate in the morning and in the evening we move up to Damthang Army camp and sell it there. it is illegal to bring Chinese goods but it is sold in abundance at Thimphu in lower market. "EVERY RULE NEED TO HAVE SENSE" and should not be MOCKED at. Pretty insightful and interesting sir!